Featuring 19 examples of Navajo wearing blankets, Finished in Beauty: Navajo Weaving from the Permanent Collection examines three categories of these beautiful, hand-woven works of art: the chief blanket, women's garments, and the sarape, all drawn from the Lowe's Alfred I. Barton Collection of Native American Art. 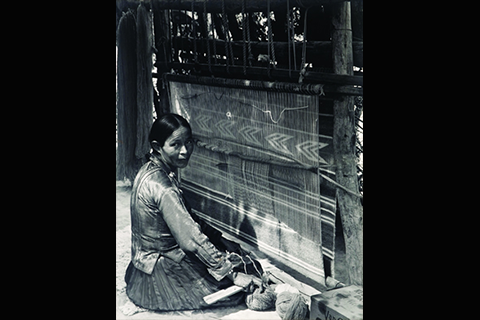 A fourth module of the exhibition focuses on the weaving process, from wool production to the weaver's final creation, and includes examples of textile weaving implements and documentary photographs by Laura Gilpin taken on the Navajo Reservation in the 1950s. The Navajo, Athapaskan peoples closely related to the Apache as well as to tribes in northern Canada, may have arrived in what is now the Four Corners area of the southwestern United States by the fourteenth century. In the region, they encountered the nearby Pueblo Indians and, by the mid-sixteenth century, the Spanish, who undertook their first major push northward from Mexico with Francisco Vázquez de Coronado's 1540 expedition in search of the reported Seven Cities of Gold. The Navajo likely learned weaving techniques from the Pueblo Indians, who grew cotton and yucca for the weaving of ceremonial garments, but with the arrival of the Spanish came additional design influences, the importation of dyestuffs, and, most critically, the Churro sheep, introduced into the region in 1598. Banded chief blankets are some of the most well-known examples of Navajo weaving. Categorized into three phases, or styles, the exhibition includes a rare example of a first-phase, "Ute-style" chief blanket dating to 1840-1850, one of the earliest in the museum's collection. Primarily collected by Plains Indians like the Ute and Comanche, chief blankets, which developed more intricate patterns in the progression of their phases, were important trade items for the Navajo. Women's two-piece dresses, called bííl, were typically two matched panels attached at the shoulders and waist, and featured designs taken from basket weaving, as did their mantas or shawls. Pre-1860 classic period sarapes, a category that include both wearing blankets and ponchos, featured more intricate design elements and color patterns, and were woven from both handspun wool and wool that was "raveled" or re-spun from imported trade cloth. Beginning in 1864, the Navajo people were confined by the United States government at Bosque Redondo (Fort Sumner, New Mexico). Stripped of their belongings, the Navajo were completely dependent on the U.S. Army for their survival. During this devastating period of Navajo history, weavers were introduced to Spanish American textiles from the Rio Grande area. New design elements, such as the Saltillo star pattern, influenced their weaving once the Navajo were released to the newly formed Navajo Reservation in 1868. These influences led to a shift from classic period designs into a transitional period (1865-1895), which included an increased use of commercially produced wool and commercial dyes and lasted until the late nineteenth century. By the turn of the twentieth century, the commercial availability of wearing blankets, such as the Pendleton Blanket, led to a decrease in their hand weaving. At the same time, non-Indian traders, who operated a number of trading posts in and around the Navajo reservation, influenced weaving production with an eye towards building a market for hand-woven rugs, especially in eastern cities. Despite its decline in popularity, the nineteenth-century hand-woven Navajo wearing blanket remains one of the most enduring artistic legacies of the Navajo Nation. A member’s preview on Friday, January 24, 2014 will feature a lecture by Bill Mercer, curator of the concurrent exhibition Pueblo to Pueblo: The Legacy of Southwest Indian Pottery, beginning at 7 p.m. at the Storer Auditorium, University of Miami School of Business, with a reception following at 8 p.m. at the Lowe Art Museum. The lecture is free for Lowe members and University of Miami students; the reception is free for Lowe members and $10 for non-members. Also on view during the reception will be the newly re-installed Alfred I. Barton Wing of Native American Art. A Family Day will be held on Sunday, March 16, 2014 and will include a Native American puppet performance for all ages, entitled "Tales of Light", from 1 p.m. - 2 p.m. at the Storer Auditorium, University of Miami School of Business. Master storyteller and puppeteer, Hobey Ford, shines the spotlight on three Native American tales teaching about light and life. The native people told numerous stories about fire and the sun to teach not only about light and warmth but to shine a light on many life lessons. "Little Grandmother Spider Woman" is a Cherokee animal tale from North Carolina about the danger of fire. The story is also about false pride and boastfulness, or in other words, bragging. Through the story, we also learn about an important craft of the Cherokees: pottery. "Raven steals the sun" is a Haida tale telling of Raven the Trickster's antics in stealing back the sun from a selfish chief who keeps the sun in a box for himself. In "The Gift of Fire", gifts were given to all creatures except man, so hummingbird flies to the sun to bring back a gift for man. Man discovers the uses and dangers of fire in this cautionary tale. Support for the exhibition at the Lowe Art Museum is provided in part through a grant from The Miami-Dade County Department of Cultural Affairs and the Cultural Affairs Council, and the Miami-Dade Mayor and Board of County Commissioners.